(Lake Forest, Calif.) – Highlighting the historic Serrano Adobe, Rancho Days Fiesta explores life in California in the mid-1800s. Experience the sights, sounds, smells and tastes of the past through music, dance, crafts and food. Visitors can participate in hands-on activities while watching performers present Mexican Rancho-era and Native American songs and dance. Exhibitors will demonstrate historic skills including blacksmithing, flintknapping, basket weaving, and adobe brick-making. Each of Heritage Hill Historical Park’s historic buildings will be open courtesy of Amigos de la Colina docents. Refreshments and food available for purchase. Rancho Days Fiesta will be from 11 a.m. to 3 p.m. Admission is $5 per person ages 3 and over. Children under 3 are free. 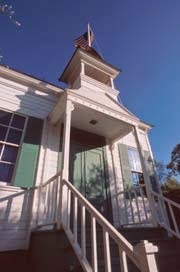 Heritage Hill Historical Park is located at 25151 Serrano Road, Lake Forest, CA 92630. Please call (949) 923-2230 for event and park information. Celebrate the legacy of early California with your family at Rancho Days Fiesta at Heritage Hill Historical Park.